The Living Stage combines stage design, permaculture and community engagement to create a recyclable, biodegradable and edible performance space. The Living Stage is a living, breathing, edible stage. Combining stage design, sustainability, permaculture and community engagement, The Living Stage is a recyclable, biodegradable and edible performance space. 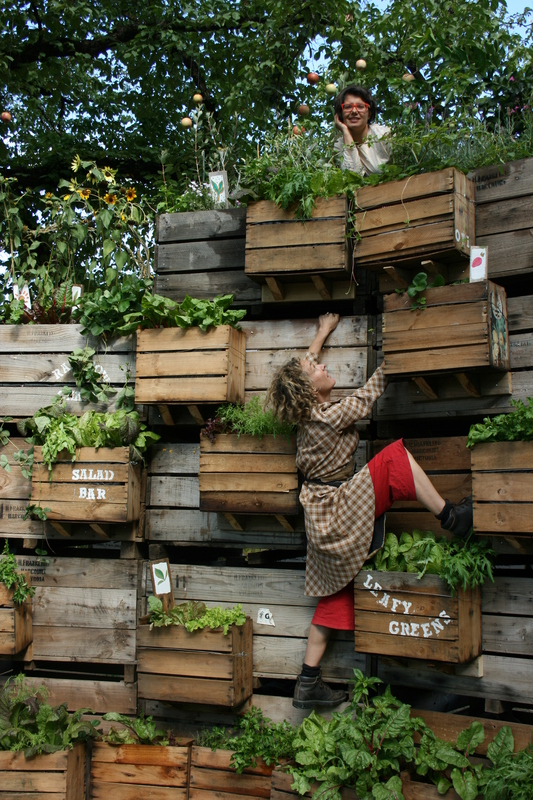 Part theatre and part garden, The Living Stage features vertical garden walls, suspended pots and portable garden beds with edible plants, and is the brain-child of stage-designer, Tanja Beer who collaborates with local permaculturlists around the world to build ‘living’ stages that are specific to site and community. Since making its debut at the 2013 Castlemaine State Festival (Australia), The Living Stage has successfully traveled to Cardiff (UK) as part of the Trans-Plantable Living Room and continues to generate interest all over the world. The Living Stage considers ecological principles, and environmental impact as opportunities rather than constraints: ethics that can illuminate, and be integral to aesthetics. It’s all about making ecological sustainability fun and inviting audiences to have a ‘nibble at the stage’. In 2013, The Living Stage set out to test a novel concept of sustainability for the Performing Arts using the platform of the 2013 Castlemaine State Festival. Part theatre and part garden; it featured vertical garden walls, suspended pots and portable garden beds each culturing edible plants. The structure was created by the rural community of Castlemaine under the guidance of stage designer Tanja Beer and permaculturalist’s Hamish MacCallum and Sas Allardice. The Living Stage acted as both a venue and inspiration for a number of local performance groups whose brief was to create experimental works that drew on the concept of regeneration, and interacted with the unique design that surrounded them. At the end of the Festival, The Living Stage was consumed by the community; its physical structures became their garden beds, its plants became their food, and its waste became their compost. Moving beyond recycling and efficiencies, The Living Stage considers how scenographers can engage with communities to play a central role in environmental advocacy and education. The project explores the role of the stage designer as an activist and facilitator of change in a world of increasing global food security. For more information about the project, please check out the following links for: images, film and press. See film for full project credits.